This entry was contributed by Wad Khalafalla, on February 28th, 2018 at 10:22 am and is filed under Innovation, Outreach Methods, Uncategorized. This blog post was written by Becca Baas, learn more about Becca below. Far too often we hear about abused or neglected children – sometimes it’s the kind of story that makes you cringe, other times it breaks your heart. I worked at Onslow County Partnership for Children (OCPC), where reducing childhood abuse and neglect has always been an important part of our mission. Now, a new movement in prevention is changing our perspective on prevention. We are developing a broader approach to address the experiences and circumstances associated with abuse and neglect. 20 years ago, a large-scale epidemiological study by the Centers for Disease Control and Prevention (CDC) and Kaiser Permanente identified childhood abuse and neglect as two of ten Adverse Childhood Experiences (ACEs) that correlate to chronic disease, mental illness, and social problems later in life. 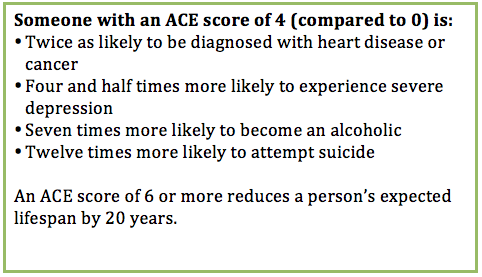 I first heard about the ACE Study two years ago, and was struck – as many people are – by the findings. 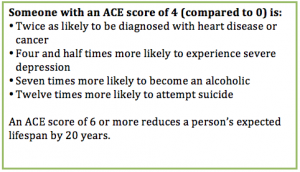 ACEs are common (about two-thirds of the 17,000+ study participants had at least one ACE) and there is a direct relationship between ACEs and long-term negative outcomes. These outcomes are caused by the way chronic and toxic stress undermine development – significantly altering how children learn, grow, relate, and communicate. Stress literally rewires the brain and changes physiology because “the body keeps the score.” As I learned more about the “largest public health study you never heard of,” I began to understand the role of ACEs in many public problems, from poverty and crime to homelessness and substance abuse. Resilient – the skill to cope or bounce back from life’s challenges. There is no prescription for success. However, every model inspires action through meaningful engagement and acknowledges the vital role of safe, stable, nurturing relationships and environments for every child. The outcomes are impressive – a coalition of 30 counties in Washington saved an estimated $1.5B over 10 years by addressing ACEs through policies and practices that improved health (Walla Walla County reduced teen suicide by 59 percent) and reduced crime (Okanogan County cut youth arrests by 66 percent). At OCPC we are beginning to integrate an ACE and trauma-informed culture into work. We want everyone to understand ACEs and how to help ensure have safe, stable, nurturing relationships. I thought a social-ecological model – often used in public health – would be useful for this evolving engagement strategy. 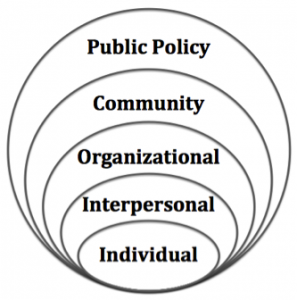 It is helping us align engagement initiatives that inspire individual behavior changes as well as trauma-informed programs, policies, and practices at the organizational and community level. ACE-awareness is still new to most people and deals with very sensitive, personal issues. With this in mind, it makes sense to focus on individual and interpersonal engagement among our own staff first. We need a common understanding, language, and a culture of resilience among co-workers before we can integrate ACEs and resilience into our programs. In January I led a basic introduction to ACEs and a workshop designed to help staff understand how they affect children at school. We also watched and discussed the documentary film Resilience: The Biology of Stress and the Science of Hope. As this groundwork continues, staff members are already sharing their new understanding with personal and professional networks throughout the community. We know building momentum across sectors of the social-ecological model is important, but a sequential approach is neither realistic nor necessary – ongoing, iterative, and concurrent initiatives are important. Once all OCPC staff are trained, we will begin ACE screening for some clients and reinforce resilience resources in all existing programs. We plan to host screenings of the Resilience film, facilitate discussions, and share our training content with other organizations. We partner with many local stakeholders to prevent abuse and neglect. Even though the American Academy of Pediatrics acknowledges “the powerful role that toxic stress can play in disrupting the architecture of the developing brain, thereby influencing behavioral, educational, economic, and health outcomes decades and generations later,” only a small percentage of pediatricians currently screen for ACEs. We will need to engage, advocate, and create opportunities for dialogue and collaborative learning in order to encourage more holistic, integrated approach to their work. 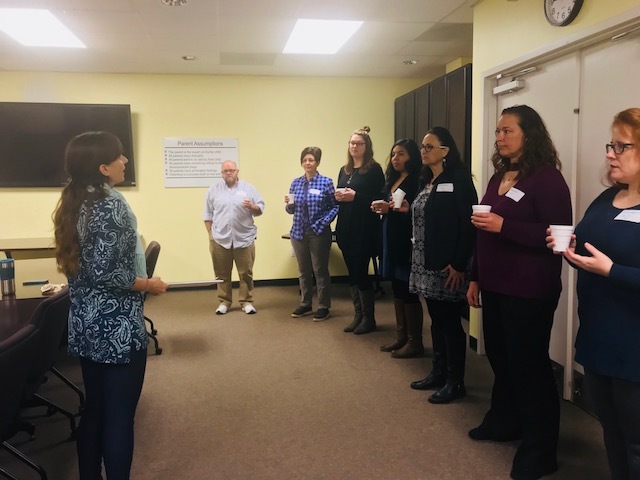 Established initiatives like the ACE Learning Collaborative in Buncombe County caution against limiting organizational and community-level engagement to only traditional partners. We recognize the important role of families affected by ACEs and their complex support networks as we continue to identify new allies and next steps. We must develop the relationships and effective engagement strategies to share an appreciation and understanding of how this movement can benefit the entire community. People at the forefront of this movement emphasize that many small actions can generate significant results. Our ability to connect with people and inspire change in their lives, their organizations, and their community hinges on effective engagement. We accept that there is no perfect path , but are confident everybody in Onslow County can be a part of a brighter future. 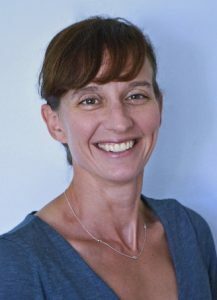 Becca Baas is the Special Projects Coordinator at Onslow County Partnership for Children (OCPC) in Jacksonville, NC – a local nonprofit focused on uniting the community to ensure healthy development of all children. Drawing on her experience as a US Marine, mother of four, and military spouse, she is inspired to find balance and develop resilience in her community as well as her own home. She earned a Bachelor of Science in Mechanical Engineering from the United States Naval Academy and a Master of Public Administration from the University of North Carolina at Chapel Hill.